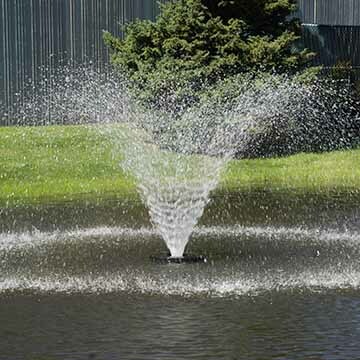 The Vitaflume® Floating Fountain is the perfect 1/2 HP fountain for small ponds. Matching beauty with function and price, the Vortex is the standard pattern for our aerating fountains . The Vitaflume® Floating Fountain is shipped to you direct from the manufacturer. It has a stainless steel pump housing and filter and uses an impeller to project water at a high volume. 115 V, 60 Hz, 10 Amps: 6' HT. x 15' DIA. 10 amps (1800 watt); Single-Phase (115 V) 60 Hz.